IKEA are including a range of virtual IKEA furniture in the latest update pack for the Sims 2 game - the 'IKEA Home Stuff update pack'. The IKEA Sims 2 update pack allows game players to furnish their virtual homes with virtual IKEA products. The IKEA Home Stuff pack will include some of IKEA's most popular products with Sims 2 players being able to add a Malm bed, an Ektorp sofa, a Leksvik coffee table, Helmer drawers and even Lack shelving to their virtual homes! 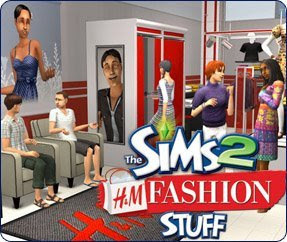 The tie up between IKEA and Sims 2 comes a year after another Swedish company, H&M, ran product placement in the Sims 2 game with the 'H&M Fashion stuff' Sims 2 update pack selling over 1m units! The H&M update pack allowed Sims players to dress their characters in H&M clothes and show them off in virtual catwalk shows (more here - http://adverlab.blogspot.com/2007/07/h-brings-fashion-to-sims.html). These examples show how advertisers are getting more sophisticated in the ways that they are using ingame advertising with advertisers creating deeper engagement than seen previously - where ingame ads have tended to be either virtual posters or game sponsorships. Brands have experimented with product placement in Second Life and at times have been disappointed with the numbers of interactions / the available audience. Integrating product into virtual games like the Sims means that advertisers can offer similar 'Second Life-esque' experiences to a significantly larger audience with the additional opportunity to use logos on point of sale merchandise and packaging. If the IKEA placement works, then it wouldn't surprise me to see more brands developing their ingame presence in this way.